Your heart begins to pound, your hands begin to shake and sweat, and your mouth goes dry. You notice your breath becoming rapid, making it difficult to breathe. You cannot concentrate or interact with those around you. Your mind is so cluttered with thoughts that your acute hearing is even affected. You feel nauseous to your stomach and anticipate a panic attack at any moment. Are you suffering from a physical condition such as a heart attack? Well, not exactly. Instead, you are suffering from glossophobia, or an extreme fear of speaking in public. Affecting 75% of the population, this fear of public speaking can greatly impede your professional success. There are very few jobs in which you do not have some type of interaction with a group of people. 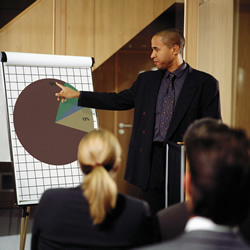 In fact, many jobs require speeches for conferences, meetings, or client proposals. You must first determine what it is that you fear. For most people, they fear that something bad will happen during the speech. Perhaps you will pass out from anxiety, or become tongue tied, or drop your note cards. However, it is important to remember that, in most cases, the audience has been in your situation before and understands the nervous jitters. If you drop the note cards, pick them up and move on. If you become tongue tied or forget your thoughts, take a moment to recollect and move on. If you are devoting most of your energy on seeking 100% audience approval, know that in most cases, this doesn’t happen. There will always be that one person who doesn’t agree or sees things differently. While these fears are common, they are often irrational and overblown. Dropping your note cards does not mean that you will lose the deal. Forgetting one line doesn’t lose all of the audiences’ respect for you. If the speech is for a professor or client, you may fear losing their respect should you stumble a few times. I can still remember my first college speech. The professor warned us that she would be counting how many times we said “uhm” or “uhh.” Guess what I did throughout the whole speech? I was so focused on her approval, that my message fell flat. The next time you must deliver a speech, try these tips to prepare. Practice the speech in front of a mirror or with a group of friends. Feedback can help you improve your message. Avoid writing your entire speech out on a 10 page manuscript. Guilty of this, I have found that it only confuses me to try to plan the speech word for word. Instead, choose 1-3 main key points or topics and focus on that. Don’t bore the audience with every, intense, insignificant detail. Instead astonish them with your knowledge on the chosen 3 points. Use colored note cards. Also, number the note cards. If you do drop them or they become disorganized, you can quickly look to the numbers or color to find your place. Dress the part. If you look good, you will feel good. Avoid wearing zippers or buttons that you could fiddle with. This may be distracting to the audience. For the most part, keep your hands at your side and avoid fidgeting. However, some parts of your speech may benefit from hand gestures or some movement. As you are sitting waiting to begin, take deep breaths. Focus on breathing. If you are the type of person who gets nervous in anticipation, volunteer to speak first. Get it over with. Some sufferers find that their confidence increases as the speech goes on. The first minute or two may be rocky, but as they get used to speaking and the crowd, they usually are surprised at how fast the time went. However, some sufferers find that their anxiety and fear increases as the speech goes on, making them tongue tied or disorganized. Try taking deep breaths and collecting your thoughts at the beginning of each note card or topic. While eye contact is very important, it may be intimidating to look a stranger in the eye. Create an invisible line across the room to look at. Be sure to sweep the room and avoid staring at just one side. If applicable, encourage audience participation. If so, you may quickly feel like you are simply participating in a conversation, rather than giving a boring speech. Also, audience participation will keep them entertained and interested. The worst thing that you can do is simply avoid public speaking. In reality, your job will probably demand some form of public speaking in the future, whether it is in front of 5 clients or 500 guests at a conference. If available, take a speech class at your local, community college. Or, perhaps hire a speech coach. Both will give you experience and greatly benefit your speaking abilities and confidence. Remember that your audience has been in your shoes. They are more forgiving than you think. While you are focusing on that one wrong word, they are focusing on your overall message. If they leave feeling positive or as though they have benefited in at least one way, you have succeeded. Sozo Firm helps startup companies, small to mid-sized businesses & nonprofit organizations thrive through developing and implementing business optimization strategies. Our efficiency consulting addresses business processes, customer service, employees, marketing, public relations, and communication. Our internet strategy consulting addresses website usability, reputation management, social media, and internet marketing. Sozo Firm is based out of Stewartstown, Pennsylvania. Contact our senior consultant, Andrew Jensen, at 800.460.SOZO to learn how we can serve you.